WASHINGTON—Another possible government shutdown is less than two weeks away, yet the dispute between the White House and Congressional Democrats about border security funding continues. 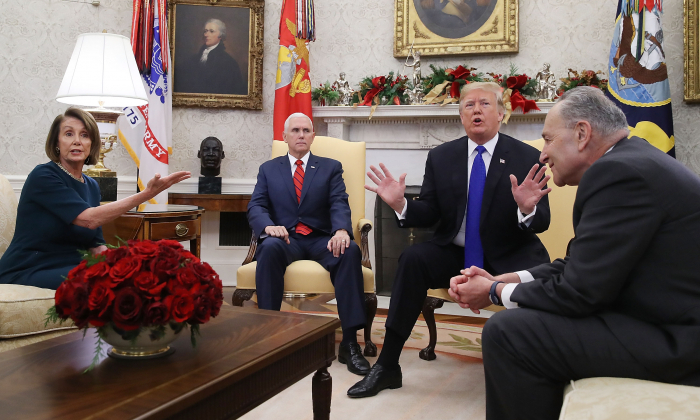 “I don’t take anything off the table,” Trump told CBS’ Face the Nation on Feb. 3, referring to another government shutdown. “It’s that alternative. It’s a national emergency, it’s other things. And you know there have been plenty of national emergencies called. And this really is an invasion of our country by human traffickers,” he said. The bipartisan, bicameral conference committee composed of 17 Democrats and Republicans was formed as part of the deal to end the 35-day partial shutdown of the government. The committee, which is tasked with negotiating a compromise on border security, met for the first time last week. While the government is funded until Feb. 15, the conference committee has only a few days left to formulate an agreement on border security spending. The group needs to wrap up its work by Feb. 8 so both chambers can vote on it by the deadline. It remains unclear if a deal will be struck by then. When the committee met last week, Republicans still sought $5.7 billion for a wall but the Democrats made it clear they would not offer new money for border barriers. The funding for the construction of a physical barrier along the southern border was the focal point of the recent government shutdown, which became the longest in U.S. history. According to a report by Goldman Sachs, Trump may agree to sign the conference report but, at the same time, invoke his emergency powers to fund a border wall if the report calls for lower-than-expected border security appropriations. “We see this as the most likely outcome because despite reaching a stopgap agreement, President Trump and congressional Democrats remain fundamentally at odds over border security appropriations but will likely seek to avoid a further shutdown,” the report stated. According to the Congressional Research Service (CRS), the president has certain other authorities to construct barriers along the border without declaring a national emergency. The report released by the nonpartisan federal agency last month refers to two sections of Title 10 of the U.S. Code—Section 2803 and Section 284. Section 2803 authorizes the president to direct the Department of Defense to “carry out a military construction project not otherwise authorized by law” for national-security reasons or protection of health, safety, or environmental quality. According to the report, the president can invoke these powers without declaring a national emergency. However, the use of such authorities may also be challenged in federal court, the report stated.